loving. living. small. 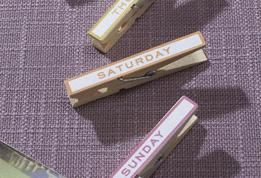 | live small with style: A SMALL ORGANIZING TIP THAT'S AN EASY D.I.Y. 3 Responses to "A SMALL ORGANIZING TIP THAT'S AN EASY D.I.Y." Very cute. My questions is: what do you do with a room that has a door on each wall and is only 7 feet by 7 feet?? The doors go to a bathroom, closet, hall and bedroom specifically. Kind of a rhetorical question about my annoying wasted room that I call the "transition room." Cute idea! I'm currently pondering what to do with our "office"-- my husband is a scatterer and so I'm trying to get his stuff coralled. I dropped by because of "Blogs of Note"-- I like your pics & suggestions! I love the peg idea. Should try it when I get home. Manythanks.